Sometimes you just need a bit of luck – or maybe even a lot of it. Luck was definitely on my side in Yellowstone. One place I had very much looked forward to photographing is Grand Prismatic spring. So when I arrived in Yellowstone that afternoon and the weather was pretty decent I headed there straight away, since the forecast for the next few days was rather a mixed bag. I hiked down a trail behind Grand Prismatic and climbed up a hill to get a nice view from above. I had just set up my camera when my eye caught some movement at the edge of the woods. A herd of bisons. 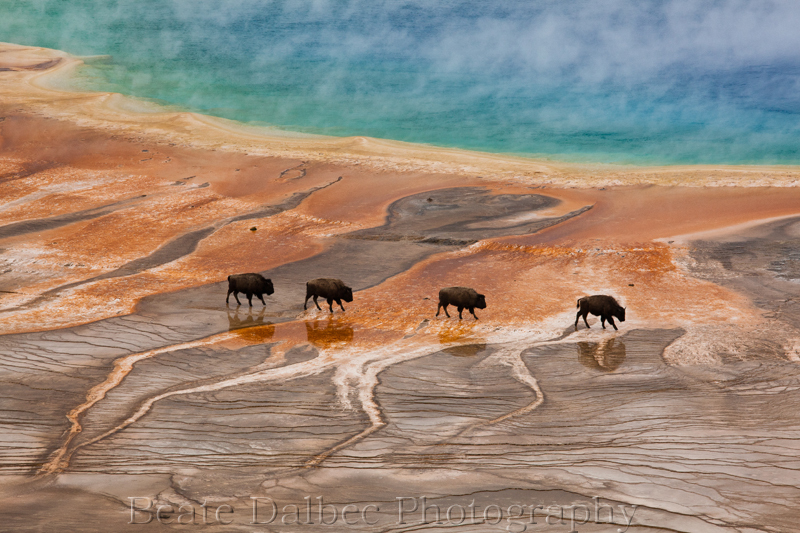 And they were heading straight for Grand Prismatic spring. I just kept pinching myself when they walked right past the edge of the spring. What a sight!!! After they left I shot a few abstract compositions and then packed up since a thunderstorm was approaching. On the trail I bumped into a few other hikers, also eager to get back to their cars. But there was one big obstacle – the bison!! Not far from the parking lot they were all standing in the middle of the trail, moms and babies, not willing to budge and it was not possible to walk around them. By now it was raining pretty good and for a while our small group had a stand-off with the bison. We were all minding the words you hear from every ranger: “Do not approach the bison – they are dangerous and can charge.” Especially with the babies around we were a bit concerned. One brave soul finally had enough and decided to walk right through the middle of the herd. He made it. So the rest of us took a deep breath and followed. Grunts left and right, but we made it to our cars! Big sigh of relief and happy to be out of the heavy rain. Patience does pay off. Very cool photo. And it has my second fave animal: bison. Thanks, seeing this was the highlight of the entire trip. Very nice photo Beate. You got it just right. Hard work, practice, patience, timing and good luck all go together to make beautiful pictures. Thank you, luck was certainly on my side to have the bison show up right at that moment. This is a great image Beate. Congratulations. Being a (non-professional) photographer myself, I can imagine how happy you are that you have been at the right place at the right moment.